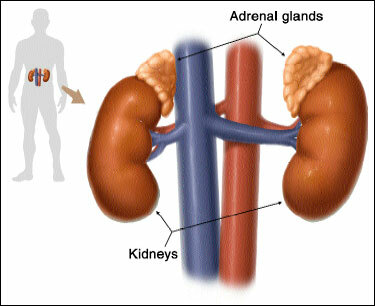 The adrenal gland is situated above each kidney and makes a number of hormones; The middle (called the medulla) makes adrenaline. 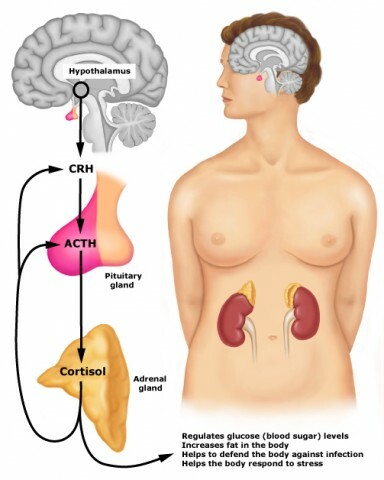 The outer part (the cortex) makes three main hormones which are required for normal health; (a) Cortisol helps the body cope with stresses such as infection or injury and helps to control blood sugar levels. (b) Aldosterone regulates salt content and blood pressure. (c) Androgens are male hormones (for example testosterone) in both males and females.